One of the most exciting features of your Topfield TF5800 PVR is one of the ones you probably won’t notice in day to day use. It’s the USB connector on the rear panel. USB stands for Universal Serial Bus, and it’s a standard connector found on just about every modern home computer. The USB connection on your PVR allows you to connect it to your computer and transfer files between the computer and the PVR. You can copy MP3 music files from the computer, and play them on the PVR, and you can transfer recorded programmes from the PVR to your computer’s hard disk. It’s even possible to use the USB connection to update the built in software that controls your PVR and to add additional software to it, to change the way that it works. We’ll explain how to play MP3s and transfer software between your computer and PVR in the next chapter. In this one, we’ll explain how to set up the software on your computer and move files to and from the PVR. Your Topfield PVR needs special software installed on your PC to connect to it, including a driver. You must install this software before connecting the PVR to the PC. 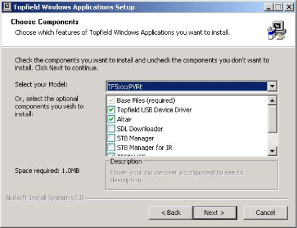 The software for your PVR is called Topfield Windows Applications Setup, and can be downloaded from the UK Topfield web site at www.topfield.co.uk. It will run on most recent versions of Windows that support USB connections, but for best results you should have a PC with a USB 2.0 connection, which is much faster. The setup program is distributed as a Zip file, which is a type of archive that you will need to extract it from; you can do this automatically by double clicking on the downloaded file on most Windows computers. After extracting the file from the archive, double click on it to start the setup wizard. Click next to TF5xxx series, and then click Next. 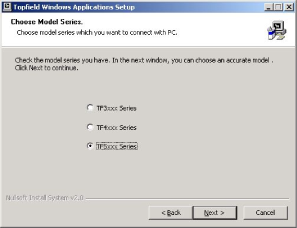 Now you can choose which Topfield applications you want to install, and which model you have. From the drop-down menu at the top of this screen, you should choose TF5xxxPVRt. In the list of optional components below, this should automatically select the correct files for your PVR, which are the base files, the USB driver, Altair, which is used to transfer files to and from your PC, TFDN USB and TFD Down, both of which can be used to update the system software on the PVR. Click the Next button to start installing the selected software on your computer. You’ll need to choose the folder where you’d like the software stored, and then click Install.